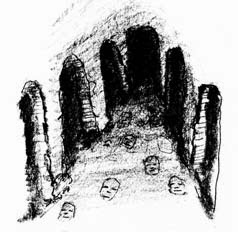 According to the story in the Gazette by Mr. Kinkaid, the archaeologist of the Smithsonian Institute, which is financing the explorations, have made discoveries which almost conclusively prove that the race which inhabited this mysterious cavern, hewn in solid rock by human hands, was of Oriental origin or possibly from Egypt tracing back to Ramses. If their theories are borne out of the translation of the tablets engraved with hieroglyphics, the mystery of the prehistoric peoples of North America, their ancient arts, who they were and whence they came, will be solved. Egypt and the Nile and Arizona and the Colorado will be linked by a historical chain running back to ages which staggers the wildest fancy of the fictionist. The recent finds include articles which have never been known as native to this country and doubtless they had their origin in the Orient. War weapons, copper instruments sharp edged and hard as steel, indicate the high state of civilization reached by these strange people. So interested have the scientists become that preparations are being made to equip the camp for extensive studies and the force will be increased to thirty or forty persons. Before going further into the cavern, better facilities for lighting have to be installed, for the darkness is dense and impenetrable for the average flash light. In order to avoid being lost, wires are being strung from the entrance to all passageways leading directly to large chambers. How far this cavern extends no one can guess, but it is now the belief of many that what has already been explored is merely the “Barracks”, to use an American term, for the soldiers, and that far into the underworld will be found the main communal dwellings of the families and possibly other shrines. The ventilation that blows through indicates another outlet to the surface. 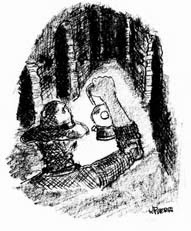 “First, I would impress that the cavern is almost inaccessible. The entrance is almost 1486 feet down a shear canyon wall. It is located on government land and no visitor will be allowed there under penalty of trespass. The scientists wish to work unmolested, without fear of the archaeological discoveries being disturbed by curio or relic hunters. A trip there would be fruitless and the visitor would be sent on his way. 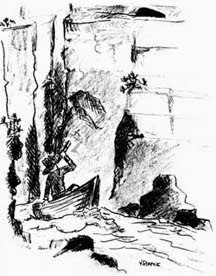 The story of how I found the cavern: I was journeying down the Colorado river in a boat, alone, looking for mineral. Some forty two miles up the river from El Tovar Crystal canyon, I saw on the east wall, stains in the sedimentary formation about 2000 feet above the river bed. There was no trail to this point, but I finally reached it with great difficulty. 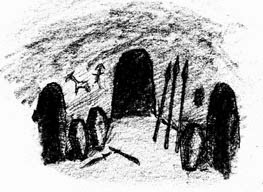 Above a shelf, which hid it from view of the river, was the mouth of the cave. There are steps leading from this entrance some thirty yards from what was at the time the cavern was inhabited, the level of the river. When I saw the chisel marks on the wall inside the entrance, I became interested, secured my gun and went in. During that trip I went back several hundred feet along the main passage, till I came to the main crypt in which I discovered the mummies. “Over a hundred feet from the entrance is a cross-hall, several hundred feet long, in which was found the idol, or image, of the peoples god, sitting cross-legged, with a Lotus flower or Lily in each hand. The cast of the face and the carving shows a skillful hand, and the entire is remarkably well preserved, as is everything in this cavern. The idol most resembles Buddha, though the scientists are not certain as to what religious worship it represents. Taking into consideration everything found thus far, it is possible that the worship most resembles the ancient people of Thibet. Surrounding this idol are smaller images, some beautiful in form, other crooked necked and distorted shapes, symbolical, probably, of good and evil. 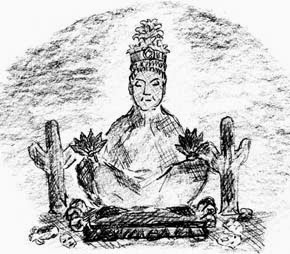 There are two large cacti with protruding arms, one on each side of the dais on which the god squats. All this is carved out of hard rock resembling marble. “The tomb or crypt in which the mummies are found is one of the largest of the chambers, the walls slanting back at an angle of about 35 degrees. One these are tiers of mummies, each one occupying a separate hewn shelf. At the head of each is a small bench on which is found copper cups and pieces of broken swords. Some of the mummies are covered with clay and all are wrapped in a bark fabric. The urns or cups on the lower tiers are crude, while as the higher shelves are reached, the urns are finer in design showing an inter-stage of civilization. It is worthy of note that all the mummies examined so far have proved to be male, no children or females being buried here. This leads to the belief that this interior section was the warriors barracks. 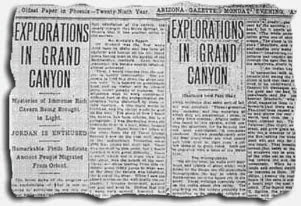 In connection with this story, it is notable that among the Hopis the tradition is told that their ancestors once lived in an underworld in the Grand Canyon till dissension arose between the good and the bad, the people of one heart, the people of two hearts. (Manchoto) who was their chief, counselled them to leave the underworld, but there was no way out. The chief then caused a tree to grow up and pierce the roof of the underworld and then the people of one heart climbed out. They tarried by Palsiaval (Red River), which is the Colorado, and grew grain and corn. They sent out a message to the temple of the sun, asking the blessing of peace, good will and rain for the people of one heart. That messenger never returned but, today at the Hopi village, at sundown can be seen the old men of the tribe out on the housetops gazing towards the sun, looking for the messenger. When he returns, their land and ancient dwelling place will be restored to them. That is the tradition.